She was a pit bull dog, abused by a young hoodlum in New York City who, in June 2009, ended up throwing the dog off the roof of his apartment building. Oreo survived and was taken to the ASPCA shelter. They repaired her broken legs, looked after her for several months, and raised funds in her name before concluding that they could not deal with her aggressive tendencies. In Hamlet, the ghost of a murdered king haunts the palace and the nation. “Something is rotten in the state of Denmark,” mutters one of the courtiers. Blood has already been spilled, and before the end of the tragedy, more will flow in order to cleanse what is rotten and restore the balance. Oreo was not a king. 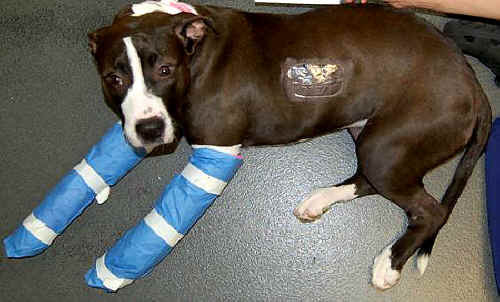 She was a pit bull dog, abused by a young hoodlum in New York City who, in June 2009, ended up throwing the dog off the roof of his apartment building. Oreo survived and was taken to the ASPCA shelter ("A"). They repaired her broken legs, looked after her for several months, and raised funds in her name before concluding that they could not deal with her aggressive tendencies. One sanctuary in particular – Pets Alive, nearby in upstate New York – had offered to take her in and give her a good life. The “A” turned them down, declaring their sanctuary to be unsuitable for Oreo. Even if you accept that assessment (I don’t), you still have to ask why the ASPCA didn’t approach other places around the country that have a history of caring for dogs like Oreo. Instead, the leadership of the “A” simply decided that the dog should die. There is, however, simply no evidence that Oreo could not have had a good life. Good sanctuaries are well equipped to caring for dogs like her. The worst she could have looked forward to would have been having a fence separating her from other dogs with whom she could have interacted and played. She would have had trained staff caring for her and helping her overcome her trauma. And the preponderance of evidence is that, with more care and rehab, she would have become less aggressive over time. More to the point, though, is that it was never tried. Before putting Oreo in a sanctuary environment, no one could possibly know what the outcome would be. Maybe it wouldn’t have worked for her. But the option was foreclosed by the “A”. There’s no question that the “A” does a lot of good work and that thousands of other pit bulls are being killed in shelters every day. But that’s not what this is about. It’s not about thousands of dogs; it’s about one dog – a dog who had become an icon and a poster girl in the New York media for all those other thousands of pit bulls who are abused and taken to shelters every day. To give up on her was to give up on all of them. To give her a chance would have been to show that we can work toward giving them all a chance. Even if Oreo had had serious behavior problems, she deserved a second chance in a sanctuary environment. A trial period could have been agreed upon – or whatever other arrangement. In choosing, instead, to kill her, the “A”, which claims a leadership role in the no-kill movement, arrogated to itself the right to destroy a dog who had become emblematic of what the no-kill movement is all about: saving the lives of animals with special needs. The bill, modeled on a similar law in California, would basically make it illegal for a shelter to kill an animal when another animal charity was offering to care for him or her. Oreo’s Law proceeded to polarize the humane community around New York and across the country. Smaller humane groups, many of whom depend on the “A” for funding and other support, found themselves in the awkward position of either challenging the “A” and risking repercussions or keeping quiet and thereby feeling soiled. The bill eventually died before being brought to a vote. Opponents of the bill argued that it was dead-on-arrival. Supporters said it had been killed-on-arrival. One thing is sure: the bill is not dead; its proponents plan to present it again next year. At the recent No-Kill Conference in Washington, DC, almost a year after Oreo’s death, New York Assemblyman Micah Kellner, one of the two sponsors of the bill, held his audience of 300-plus people riveted for about an hour as he told the story of Oreo’s Law, from birth to un-death. It is, of course, his version of the story, and the “A” would doubtless tell it a different way. Still, it reads like a political thriller. As Kellner tells it, agreements are made, then broken; lies are told; veiled threats are made to groups that might stand up against the status quo. Whether the bill was a good one – whether it could have been amended in a way that would have enabled it to become law – is something I cannot personally judge. Kellner says he agreed to almost every change the ASPCA wanted and that the “A” still opposed it. There are people, both pro and con, who are more expert than I on the legal issues. They are, on both sides, people whom I admire, respect, and am friends with. One argument against the bill is that matters like this should not be the subject of legislation, but should be worked out in other ways. I wish that were true — and it might indeed have been true if, in this case, the ASPCA had acknowledged its error and sought to work with other humane groups to ensure that something like this never happens again. It’s precisely because they have not done this that we now need a law to protect dogs like Oreo. The heart of the issue: Who gets to decide? Who gets to decide whether an animal should live or die? What gives any organization, large or small, the right to kill a homeless dog or cat just because they have him or her on their premises? By what right do they deny another rescue group the right to save that animal’s life? Those are the questions at the heart of this issue. Until and unless the leadership of the “A” steps forward and acknowledges that the death of Oreo was a tragic error, the humane world, especially around New York, will continue to be torn apart. Meanwhile, the aftermath of Oreo’s death has taken on the feel of a classical tragedy, Shakespearean or ancient Greek, wherein the decisions of a leader draw everything and everyone around him into a vortex of conflict. The ghost of one dog continues to haunt the “kingdom.” It cannot rest. Someone has to take ownership and responsibility. Absent that, the fabric of life itself is ruptured. “The time is out of joint,” and in this case, there’s only one entity that can put it right: the ASPCA. The rank and file of the “A” will have to defend a decision they were not responsible for. Humane groups that depend upon the “A” for funding and other support will continue to be in an awkward position they did not choose. And humane groups everywhere will continue to find themselves pitted against each other in the conflict that has arisen over Oreo’s Law. All of this has led to a war of words – bitter words – between organizations that should be in harmony … who are all committed to saving homeless animals. Some of the words have become personal and nasty, leading to further estrangement. But this is not their war. And they cannot settle it among themselves because, very simply, they did not start it. Only by owning up to its error can the “A” reclaim any moral authority and help ensure that something like this does not happen again. This would be an act of courage – and, at this late date, an admittedly difficult one. But as long as the “A” does not step forward, it will continue to be haunted, as will we all, by the ghost of the undead Oreo.